It's been a while since the last entry, but construction has been going at a steady pace. The second hull is sheeted and glassed. 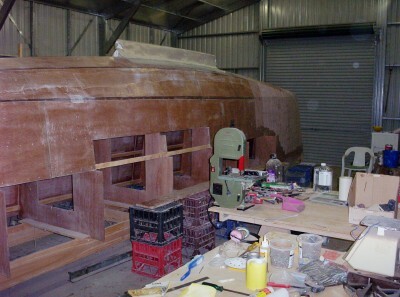 The pic shows the third layer of glass ready to glue onto the mini keel. Also, you can see some stripes of filler up at the bow. In the foreground is the band saw my dad gave me. He couldn't get the blade to stay on, so I retreaded the wheels with sticking plaster. The band saw is great for small tricky jobs.